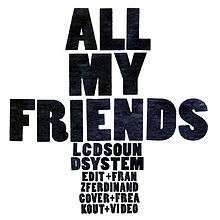 "All My Friends" is a song by American rock band LCD Soundsystem. It was released as the second single from their second studio album Sound of Silver on May 28, 2007 and was written by Pat Mahoney, James Murphy, and Tyler Pope. The song has received critical acclaim from critics and has been listed on many year-end lists by music critics. It peaked at number 41 on the UK Singles Chart. B-sides for the single include covers of the song by Scottish indie rock band Franz Ferdinand, which was produced by Erol Alkan, and former Velvet Underground member John Cale. Glaswegian indie rock band Franz Ferdinand covered the song as part of the LCD Soundsystem EP A Bunch of Stuff, which was released on September 18, 2007. Their version also appears on the first 7" and CD formats of the original song and as the b-side to their single "Can't Stop Feeling". A music video for the cover was also made, which was directed by Anna McCarthy, the sister of band member Nick McCarthy. ↑ Powell, Austin (June 11, 2010). 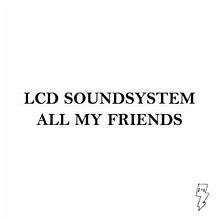 "Review: LCD Soundsystem". The Austin Chronicle. Retrieved October 22, 2015. ↑ Mark Pytlik (17 December 2007). "Top 100 Tracks of 2007". Pitchfork Media. Retrieved 26 November 2011. ↑ Rob Mitchum (21 August 2009). "The Top 500 Tracks of the 2000s: 20-1". Pitchfork Media. Retrieved 26 November 2011. ↑ "The GU Music Readers' Poll 2007 results". London: The Guardian. 19 August 2008. Retrieved 26 November 2011. ↑ Josh Tyrangiel (9 December 2007). "Top 10 Songs - Top 10 Everything of 2007". Time. Retrieved 26 November 2011. ↑ "Rolling Stone's 100 Best Albums, Songs Of The '00s". Stereogum. 10 December 2009. Retrieved 26 November 2011. ↑ Priya Elan. "150 Best Tracks Of The Past 15 Years". NME. Retrieved 26 November 2011. ↑ "Archive Chart: 2007-06-09" UK Singles Chart. Retrieved May 31, 2015. ↑ "A Bunch of Stuff EP". iTunes. ↑ "Franz Ferdinand - Can't Stop Feeling". Discogs. ↑ "Franz Ferdinand - All My Friends". YouTube. Retrieved May 31, 2015. Antony & The Johnsons – "Hope There's Someone"
Justin Timberlake featuring T.I. – "My Love"
LCD Soundsystem – "All My Friends"
Hercules and Love Affair – "Blind"
Ariel Pink's Haunted Graffiti – "Round and Round"
Drake featuring Majid Jordan – "Hold On, We're Going Home"